Northern California is an amazing place to visit. It is even better when we are hanging out with my favorite people. Terry and I spent a long weekend visiting Meg and Jake’s favorite places in Sonoma and Marin Counties. While Jake worked Friday, Meg, Terry and I loaded up Meg’s Jeep Patriot and our cameras and headed for the coast. Well, I don’t want to overstate this, Terry and Meg have real cameras, I only had my iPhone, but I was anxious to see what kind of photographs I can get out of my newly upgraded iPhone camera. Our first–unexpected–stop happened when we happened on this great tree by the road. We stopped, turned around and drove back for our first photos of the day. 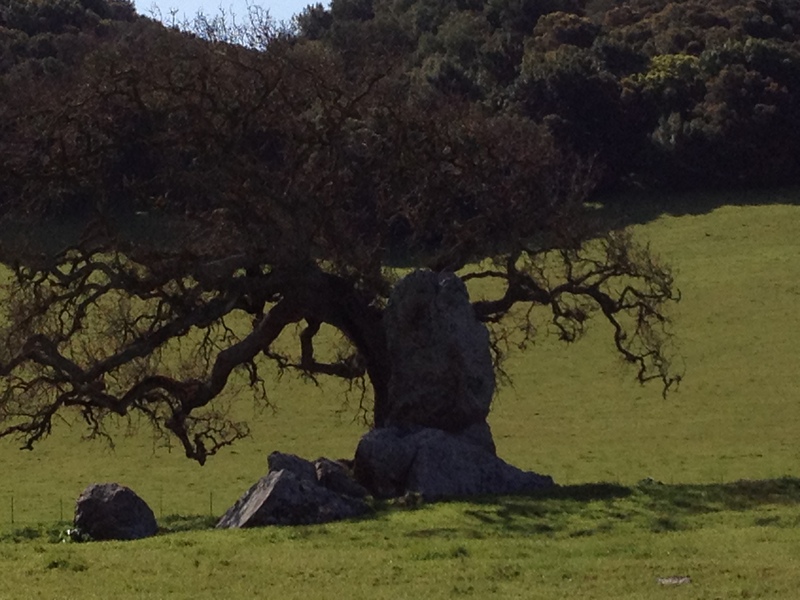 It isn’t just a great gnarly tree, it is tree that gives new meaning to the concept of having a rocky start in life. Meg’s photo was on our blog yesterday. Here’s mine. 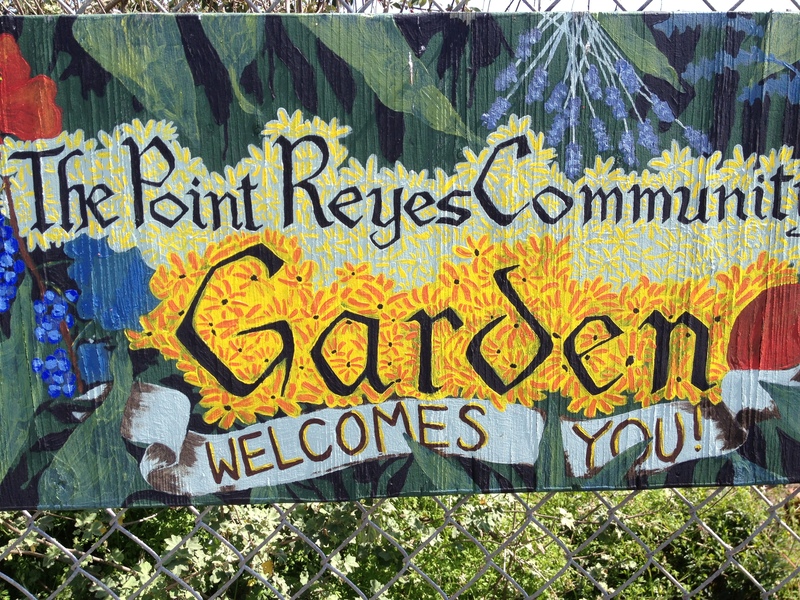 Minutes later we arrived at Point Reyes Station, a lovely little town near, but not on, the coast. It’s population is either 340 people or 848 people, depending on which source you believe. It is such a great old town. 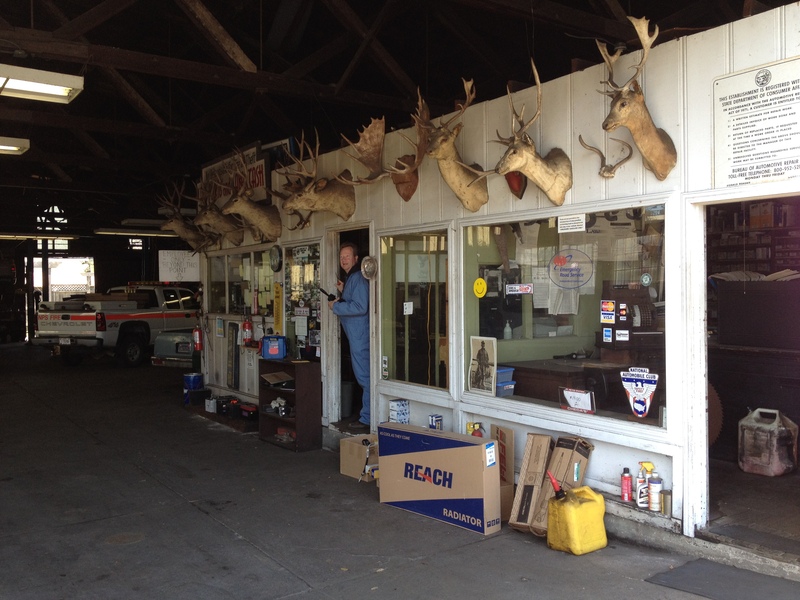 I mean, when is the last time you saw an automobile repair shop with an entire row of deer heads on the wall? 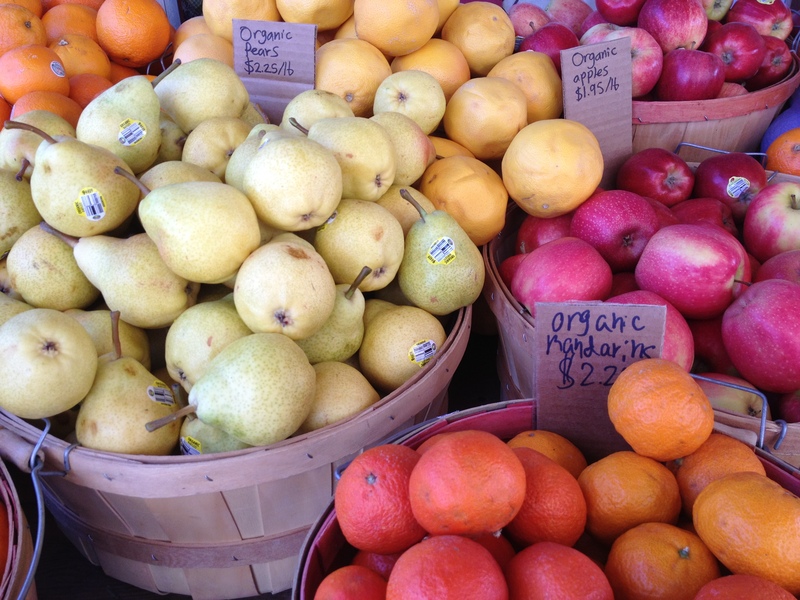 There was a community garden and an organic market that surprised me by offering beautifully arranged produce, at least some of which was from–Mexico. Meg and Terry were looking for tasty beverages while I focused on the wonderful “Born in the USA” look of this little town. 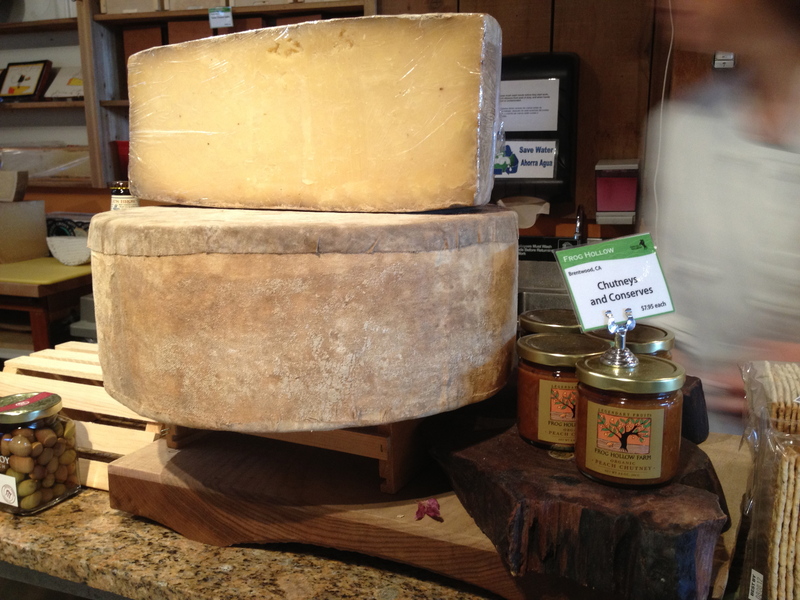 We happened on the Cowgirl Creamery that actually makes cheese right in Point Reyes Station. The cheese and the bread they sold were as visually appealing as they were delicious. We purchased a bag of sample sized cheese for under $15. The cheeses were a hit at dinner. With regret, we left this great town and continued on. 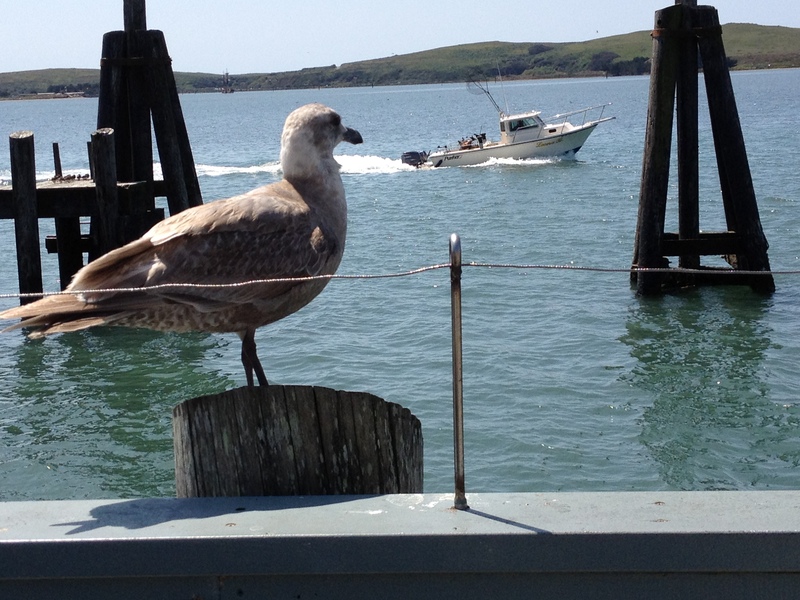 Ultimately, we arrived at Bodega Bay, well-known for its beauty, but also as the location for Alfred Hitchcock’s wonderful movie, “The Birds.” The Tides restaurant is still serving tourists, and the gulls continue to sit on the picnic tables and stare down from the eaves of the buildings. Not hard to see how a creative mind could see them as menacing. But they are actually delightful and add to the atmosphere. The views were beautiful. We were ready to try to find a way to move here just for the privilege of waking up every morning with one of the world’s great scenery. Unlike many of the places we visit, mile high condos have not yet spoiled the view. There were actually modest cottages within a block of the water. Who wouldn’t want to want to be “Sittin’ on the dock of the bay,” if the bay was in Northern California. 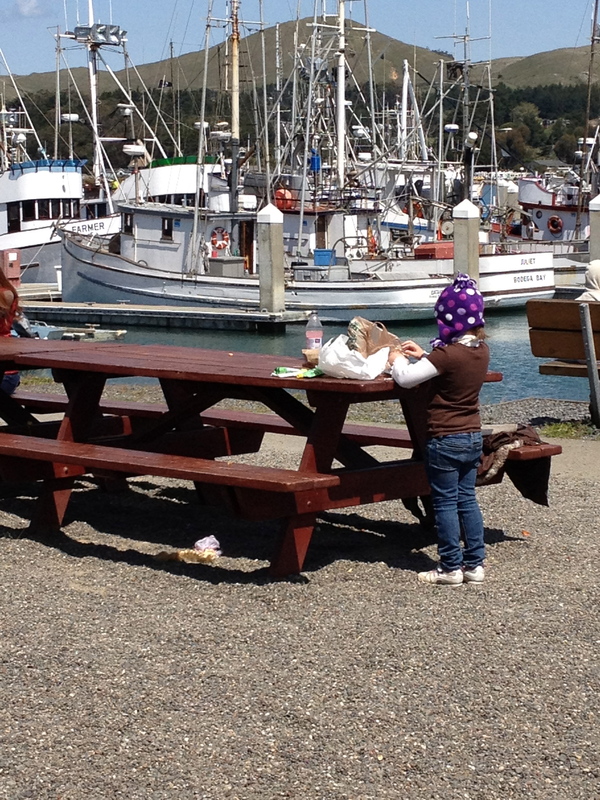 We headed to the Bodega Bay marina. Obviously, just around the corner, but it had its own personality. Commercial fishing is serious business here. Even the boats have just the right amount of rust to be authentic workings boats. The best of the “fishing” was for crab. 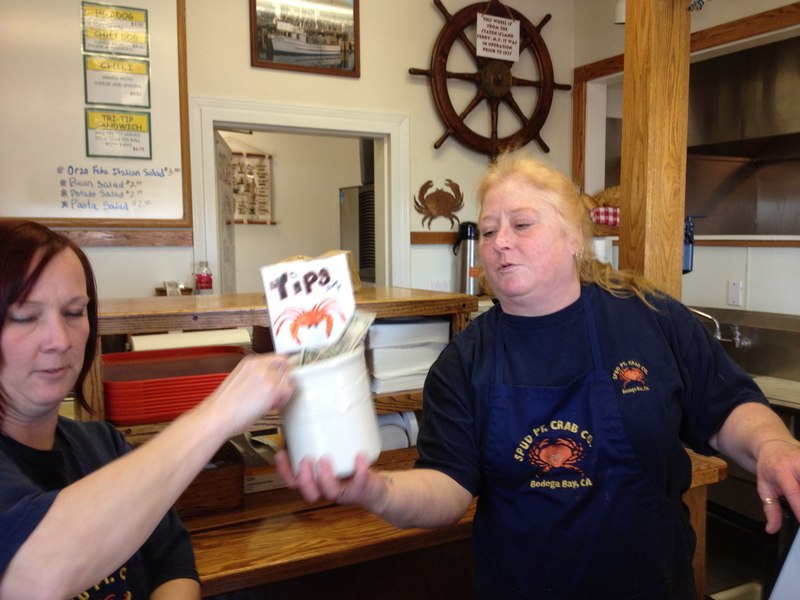 We stopped at the Spud Point Crab Shack crab. Just about all it sold was crab, crab and crab. But why not! It was freshly caught and it was wonderful. We shared a sandwich and were on our way. 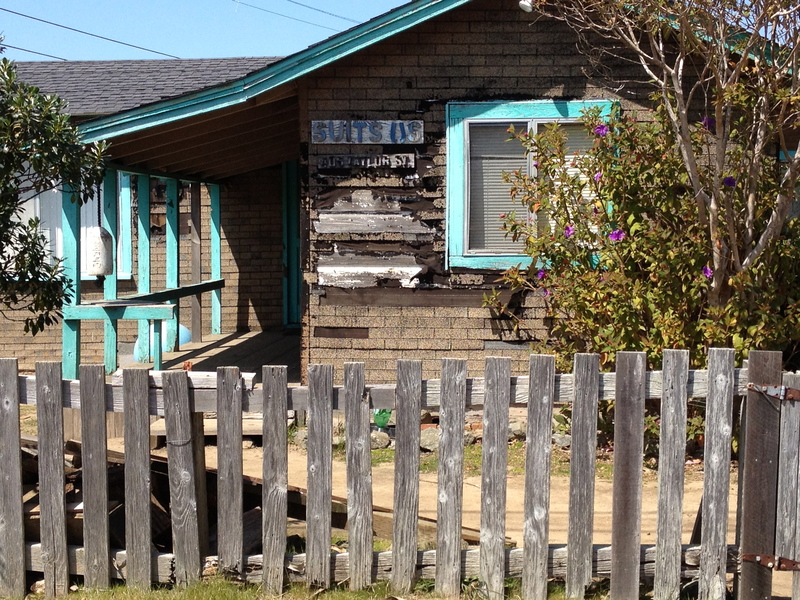 The area had fun with its heritage. 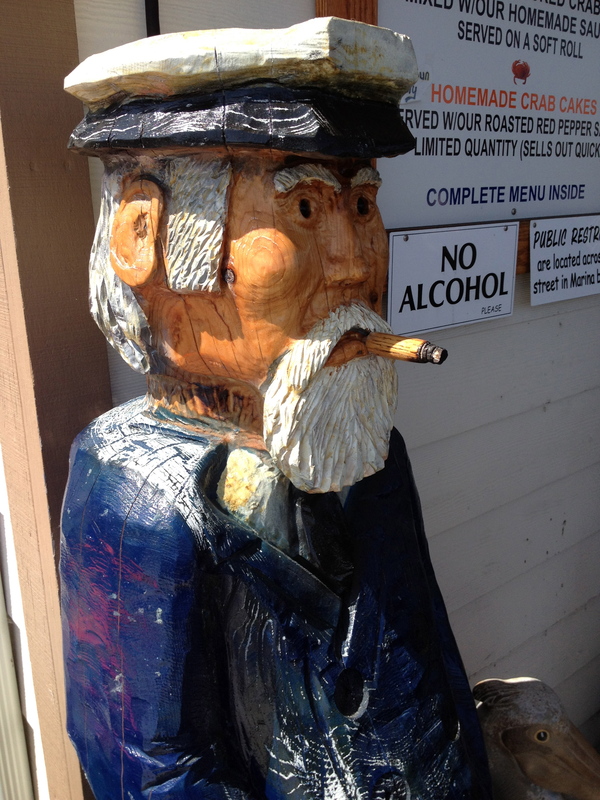 Carved wooden sailors graced more than one establishment and gave a festive air to the marina. Our last stop along the coast was Bodega Head. It is a beautiful view of the ocean and is considered a major destination for anyone who wants to watch for migrating whales. We looked, without success. 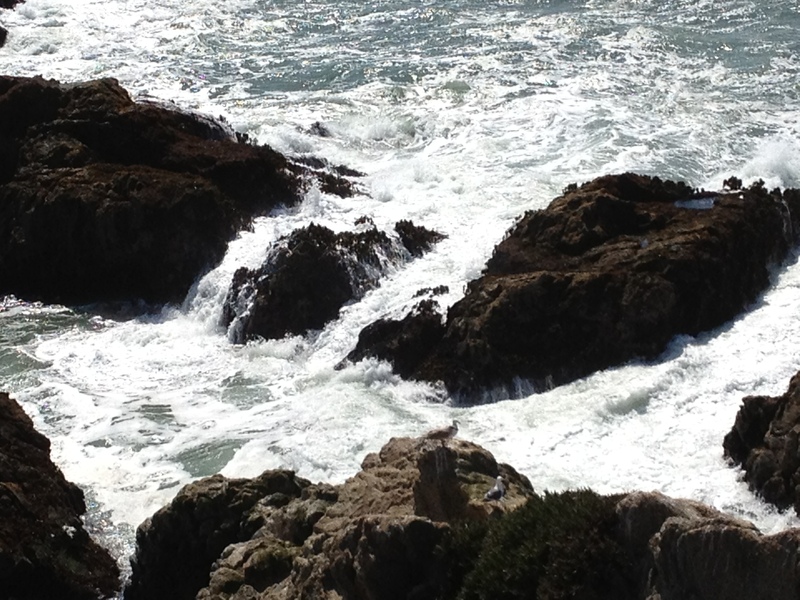 But we watched the waves as they came in over the rocky beach. It was a great day on the coast, and we’ve had a great time comparing my iPhone pictures with the pictures from Meg’s camera. Next, it’s off to the wine country. 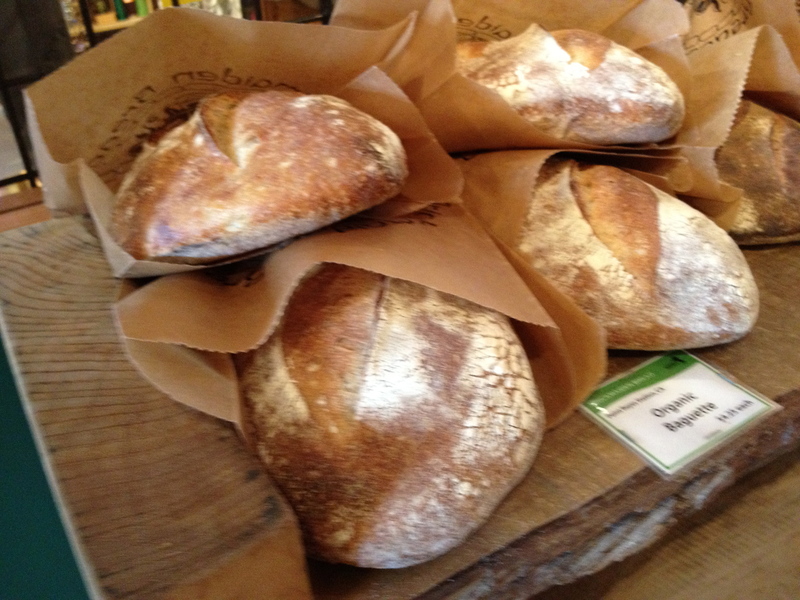 This entry was posted in Travel & Adventure and tagged Bodega Bay, Bodega Head, Cowgirl Cheese, iPhone camera, Northern California Coast, Photography, Reyes Point Station, Seashore, Spud Point Crab Shack. Bookmark the permalink. Really beautiful photos! I love the color and lighting, keep it up! Northern California is beautiful. I never tire of its beauty. Nice post. What an unusual result for an ages old activity. As a girl I remember we put sea shells up to our ears. We were sure we heard the sae. None of us ever was bitten. The world is full of new experiences. trading links or maybe guest authoring a blog article or vice-versa?